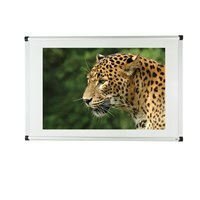 The projection whiteboard does exactly what it says on the tin.. allows you to project images onto the surface. The surface is finished to prevent the typical glare you would see with a standard whiteboard, this makes the projection whiteboard perfect for presentation situations and the classroom environment. Every presentation suite should be fitted with a projection whiteboard for optimal delivery of the talk/lecture/pitch. The last thing you need when you’re in this situation is to lose the attention of the audience to the frustrating presence of gaping white shimmer.